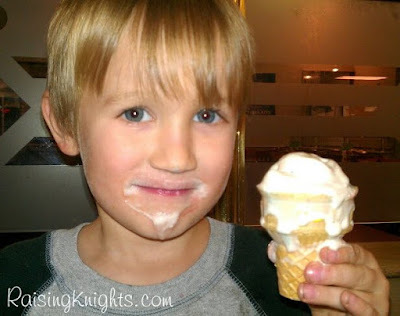 Raising Knights: Wordless Wednesday #19 - "How to Eat Ice Cream"
Wordless Wednesday #19 - "How to Eat Ice Cream"
The key is to take your time and let it melt, not making any effort to lick around the sides. Linked to 5 Minutes for Mom and Mama to 4 Blessings. Haha...your comment makes me laugh. My girls drive me crazy when they don't even try to eat it and prevent the melting, or just lick a little off the top and let it melt down the sides.